And you’re wondering how Billy Beane relates to a blog about SAT and ACT composite scores? Read on. Interestingly, rumor has it Beane no longer uses Moneyball. When just about every team adapted the practice, he no longer had a competitive edge (photo credit: Brett Farmiloe). 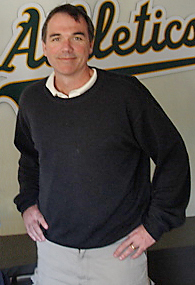 Billy Beane, the longtime GM of the Oakland A’s, was a pioneer of Moneyball, the practice by which decision-makers in baseball rely on data-driven analytics in lieu of traditional scouting. Beane, like Theo Epstein, Sandy Alderson, and many baseball executives of our time, realized that certain aspects of the game of baseball are overvalued by traditional scouting (e.g., athletic ability), whereas other characteristics are undervalued (e.g., getting on base by any means necessary — like walks). Well, here’s a dose of Moneyball for highly selective college admissions. SAT and ACT composite scores are overvalued…by many parents and college applicants to highly selective colleges, that is. Do composite scores count? Just like home runs, they do. But they don’t count to the extent that you might think (if you’re confused by the baseball analogy, data-driven analytics proved that seeking home run hitters wasn’t an ideal course of action — they should instead seek players who, quite simply, get on base). Composite scores just don’t matter a ton at highly selective colleges. Do they matter at lower tier universities or public universities? Yes. But at the highly selective colleges, composite scores are overvalued…much like athletic ability. Most of baseball uses Moneyball nowadays. Moneyball challenged the status quo until it became the status quo. Well, today’s status quo in highly selective college admissions is that SAT and ACT composite scores are entirely overvalued by parents and college applicants. Sometimes, when one of our students gets a really low score on one section of the SAT, an aberration from a previous SAT score, we will tell them not to submit this score to colleges even if the test, on the whole, increased his or her SAT composite score. So, to put it in specifics, if a student received a 730 reading, 720 math, and 800 writing on his or her first administration of the SAT and then received a 770 reading, 650 math, and 740 writing on the second administration, we’d prefer that student not report that second administration. And we’d prefer he or she take it a third time. Because the student can clearly get the reading up, but we don’t want it to be to the significant detriment of the other two sections. We don’t want to call into question the other scores. Have a question about SAT and ACT composite scores? Let us know your questions by posting a Comment below. We look forward to hearing from you. And if you’re interested in tutoring for the SAT or ACT, we offer one-on-one instruction to students around the world via Skype, regularly boosting their test scores significantly. Indeed we’ve got data-driven analytics to back this up. Seems a given that the first sitting shouldn’t be reported. Should the third, given that the writing section score went down so much (by the way, while it seems like the 780 writing score was a fluke, her writing diagnostic scores were mainly 770-800)? Should she take it one last time, or is 4 “too many?” Btw, she’s also taken the ACT and received a 34 (on her second try). I think your daughter should submit her 34 ACT score only. It’s a near-perfect score. If you would like submit SAT scores 2 and 3, but with a 34 ACT, that may be unnecessary. I only did the SAT and 2 subject tests and I was admitted to Harvard and Princeton, amongst other Ivies. Both exams aren’t necessary. * I apologize – the second SAT writing was 780 (taking the essay into consideration). While we give out quite a bit of information on our blog, we do not give away the store. Your question would be answered during a paid consult by Ivy Coach. Thank you. Yes, but regular readers of our blog know that we don’t answer specific questions about a high school student’s case for admission on our blog. We put a lot of information out there for free. But we never give away the store. Our secret sauce is expressly reserved for our clients. Thanks for writing in. And we’re not sure “Harvard Girl” is an expert on admissions just because she happened to get into Harvard. Most highly selective colleges require you to submit ALL your scores so you would not have the option to not submit the 2nd set of scores. Stanford, Georgetown, University of Pennsylvania require you to send in ALL testing. Yale was one college that allowed you to submit ACT or SAT. But if you submitted one SAT, you had to submit all SAT scores, same for ACT. Harvard and Princeton do allow score choice. I took the SAT twice and the first time I scored only a 2090. The second time I scored a 2210 (720 M, 750 CR, 740 W). In terms of school I have a 4.0 UW GPA and will have completed 17 APs by graduation. I also will have 2 published research papers. What are my chances at ivies with these scores, and is the SAT score not high enough? And is it necessary to retake third time in October. My subject test scores are 790 WH and 760 Bio M.
We don’t chance people on our college admissions blog. If you’re interested in a consultation, please click on the orange button on our website and fill out the form. Please note, though, that we will only discuss the specifics of your case during a paid evaluation. After all, we are a business and we make no apologies for this. Thank you for writing in. I’m wondering how selective colleges use the act writing score. I’ve heard it’s not as important as the other sections, but I’m not sure if that’s true. Well I’m sure they still take it into consideration. Well, this is my first visit to your blog! Your sat and act scores information blog provided us valuable information to sat and act scores. You have done a excellent job! Thanks for such post and keep it up.